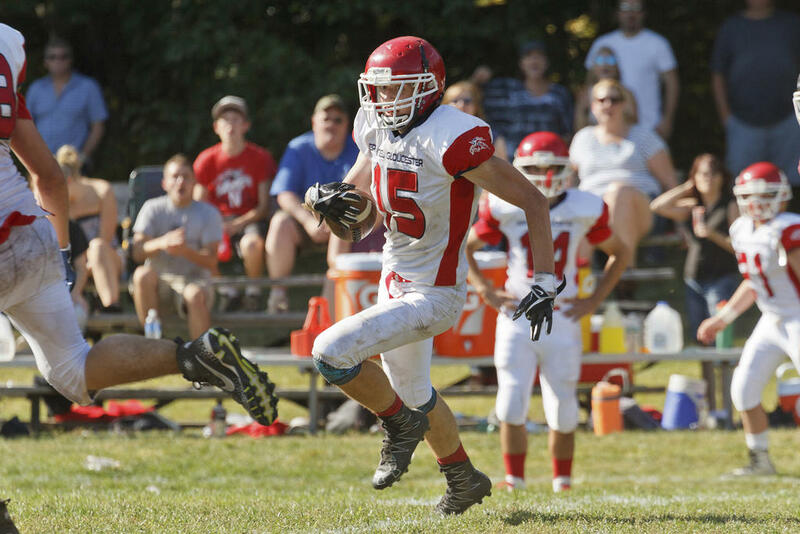 Jaykob Sanborn carries for the Patriots at Freeport on Saturday. FREEPORT—Case in point: The Patriots vs. the Falcons, Saturday afternoon, Sept. 23. Two programs, battling to develop, each winless through the first three weeks of the 2017 season. Both teams took to the field hoping for a competitive bout; both had gameplanned extensively. Only one, though – Freeport – executed like they needed to, and it allowed them to soar easily over G-NG. 41-6 the final. See, in a battle of 0-3s, it might not seem like much is on the line, but it is. These teams may not be bound for States, but that merely means States isn’t the goal: clinching the last playoff berth is – or even clinching a single win. Because wherever a proud squad ranks, the achievement that seems just out of reach is the one they hunger after: Going 1-7 in a season when you appeared fated to go 0-8 may not feel quite the same as hoisting a gold ball…but it still feels mighty sweet. So, props are due to the long list of Falcons who contributed to the big W, from Seniors like Josh Burke and Mike Foss all the way down to freshmen like Justin Cogswell. And props, too, are due to the Patriots who never gave up – including lone scorer Trent Overcash – and who will no doubt come out fighting just as hard next week. The Falcons put up 14 points in the first on TDs by Adam Ulrickson and Burke. They put up 14 in the second, too: Wide receiver Mike Foss, scooting through the G-NG end zone around the 9:35 mark, caught a pretty pass from QB Josh Burke and, six minutes later, James Knighton ran a short score home. The Patriots weren’t without their moments, though: Isaiah Thongsavangh sacked Burke early in the third to force a Falcons punt, and Jaykob Sanborn ran a slick, winding route for 23 on the first snap of the ensuing G-NG series. But the visitors couldn’t put it all together, and all too soon turned the ball over again, allowing Freeporter Jacob Tomm to post the Falcons’ fifth touchdown of the afternoon late in the quarter. Cogswell then tallied their sixth midway through the fourth. The Patriots did eventually get on the board: Overcash returned the kickoff following Cogswell’s touchdown to first and 10 at G-NG’s own 33. From there, Overcash took a stab left, but found himself stuffed. He tried again on second and 10 – and this time managed to break away, zipping 69 long yards into Freeport’s end zone for 41-6. Those points, however, would prove the last of the day. Freeport, of course, advances to 1-3 with the victory. The Falcons are, in fact, currently ranked eighth in C South; if they can hold on to that slot, they will reach the tournament. Of course, several tough regular-season bouts still remain ahead of them. The Falcons host Spruce Mountain on Saturday the 30th, then travel to Morse on Friday the 6th. The close out their schedule vs. Gardiner on the 14th and Yarmouth on the 20th. The Patriots slide on the loss to 0-4. If the team is going to pick up a win this fall – and there’s plenty of hope that they still might – it’s most likely to come against Medomak Valley on the 6th or Yarmouth on the 13th. Next week, they travel to Cape Elizabeth. Isaiah Thongsavangh ditches a would-be Freeport tackler and dashes forward. The G-NG line jumps off their mark after the snap. Scott Lynch carries for the Patriots at Freeport on Saturday. G-NGer Trent Overcash tallied the team’s only TD on Saturday.